Sculptor Doris Salcedo has unveiled a hole at the Tate Modern - the latest installation in the art gallery's Turbine Hall. 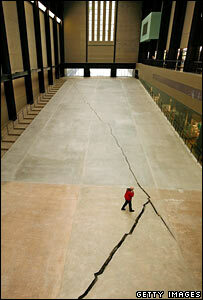 The work, entitled Shibboleth 2007, runs the full 167 metres of the cavernous hall on London's South Bank. It begins as a crack then widens and deepens as it snakes across the room. Colombian artist Salcedo said the work - on display to the public until April next year - symbolised racial hatred and division in society. "I always try to relate my work to tragedy," she said. Salcedo added: "It represents borders, the experience of immigrants, the experience of segregation, the experience of racial hatred. "It is the experience of a Third World person coming into the heart of Europe." Salcedo claims the work took her over a year to make, and apparently spent the past five weeks installing it in the Tate. But she refused to reveal how it was achieved. "What is important is the meaning of the piece. The making of it is not important," she said, adding that the work was "bottomless... as deep as humanity". Tate director Nicholas Serota insisted the work was not an optical illusion. "This sculpture has been made in the most painstaking, meticulous way by Doris and her team before it was slowly inserted into the Turbine Hall," he said. "From the Tate's point of view, there were only two questions: could we realise it in the way Doris envisaged? And once the piece was created, would it damage the structural integrity of the building forever? "The answer to the first was yes, and to the second was no." The hole will be filled in next April. Mr Serota added: "There is a crack, there is a line, and eventually there will be a scar and that scar will remain." 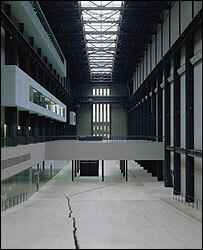 Tate staff will be on hand to warn visitors about the dangers of tripping and falling into the gap.